At the fall Curricular Leaders’ Retreat, Lynel Jackson highlighted four new and improved MEdTech features that can assist faculty in presenting information for students and in planning learning events and courses. The EdTech team has completely redesigned the way resources (such as files, links, and quizzes) are added to the Learning Events and displayed to learners in Student View. 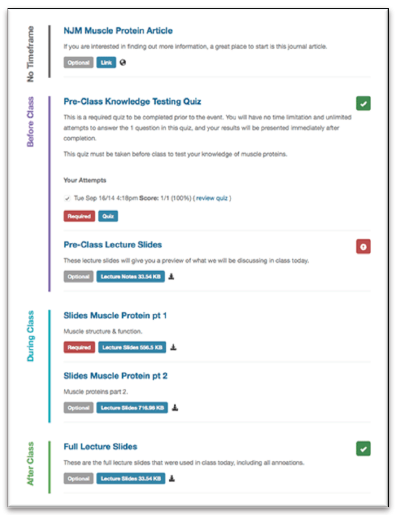 This new view uses much of the information the EdTech team has collected for years during the upload process, like “Should this resource be considered optional or required?” and “When should this resource be used by the learner?” then displays it to learners in a clear and user-friendly timeline on the Learning Event page. The new format clearly shows what learners need to do to prepare for class, and also clearly marks what resources are required versus what is for information only. In Development: In the future, these classifications will be used to provide learners with a checklist on their Dashboard, identifying all the activities they need to complete before classes for the week. 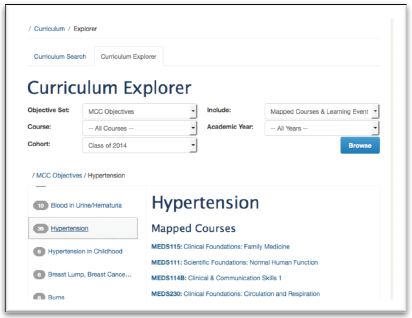 The EdTech team has enhanced MEdTech’s Curriculum Explorer tool which is now able to show not only where objectives (at any level) are mapped to Courses, and Learning Events, but also Gradebook Assessments. Faculty members and staff can use this tool to really explore the curriculum at all levels. There are a number of new and enhanced reports – such as MCC Presentations by Course, Course Objectives by Events Tagged, and Learning Event Types by Course – that can assist in evaluating past course iterations as well as planning the next one. Curriculum coordinators can generate these reports for Course Directors, on request. One of the most frequently requested features by faculty has been the ability to easily upload images or documents, and embed video into rich text areas throughout the MEdTech platform. With this Fall release, the team was pleased to announce this can now be done within any of the rich text areas. To upload images or documents, click the “Browse Server” button from within the “Image” or “Link” icons. This will open your personal “My Files” storage area where you can upload images or documents from your local computer. Once you upload the image or document, clicking it will embed the image or document directly in the rich text area. You can also embed video from the Queen’s Streaming Server, YouTube, or Vimeo into any rich text area by clicking the “Embed Media” icon, and pasting in the “Embed Code”.